An overview of Aircraft Maintenance Training: How aircraft maintenance training methodologies have evolved over the years. Aircraft Maintenance training has changed significantly over the last few decades. From training time and teacher qualification to student participation and expectations, it has truly evolved. We sat down with Jim Cairns VP, Maintenance Training who has been in the aircraft maintenance training industry for over 40 years. 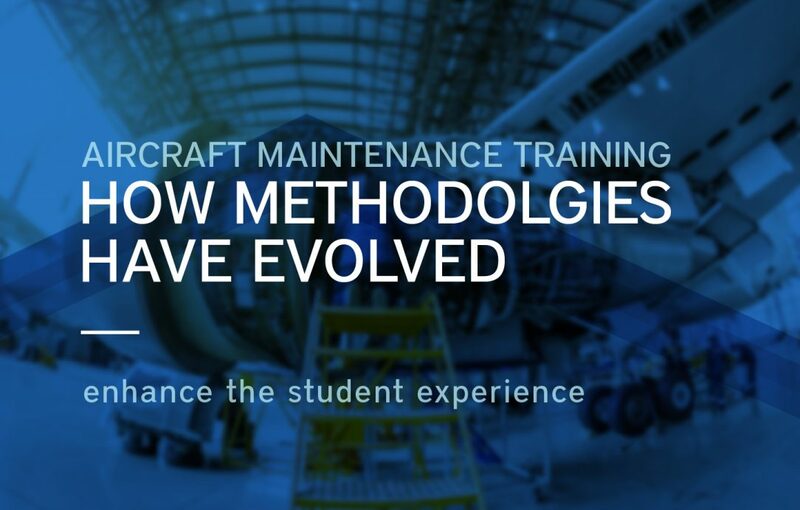 Here he provides us with an overview of how aircraft maintenance training has evolved starting with post-WWII training methodologies on the B707 and DC8 to today’s focus on new training technologies including CBT and virtual reality. Over the last fifty years in aviation, we have had some key turning points in our industry. The introduction of turbofan engines on the B707 and DC8 aircraft allowed us to move away from piston/prop engines and dramatically increase aircraft efficiencies, in both operating speeds and overall cost per flight. These aircrafts were post World War II technologies and used much of what was designed in the war and the years that followed until the end of their production. The aircraft manuals that accompanied them contained exhaustive system descriptions, with each component’s operations detailed including valves, radio units, and even the analog autopilot computers. The overall goal of the course was for the students to take on as much knowledge from the instructor as possible as there was no referring to a troubleshooting manual. Following the course, the exams would be rigorous. The harder they were, the better. With the introduction of the B747-100 and the Lockheed L-1011 in 1970 came the first troubleshooting manual. Technicians were reluctant to use these manuals at first, and often only referred to them when the technician’s best efforts failed or became questionable. At first, it was felt these documents challenged the competence of the technician, but over time, they became accepted and eventually relied on. However, the aircraft maintenance training on the B747-100 or the L1011 remained the same as what was done the generation before, just a little more complicated. The technician’s memory was everything. Student expectations remained the same and the training regulations did not keep with the changing technologies. The biggest change was that the course was now 12 weeks in length due to the added information. It is believed that regulators thought longer more complicated courses equaled more flight safety. From the early 1980s to the present day, commercial necessity started to drive the airline industry. Time meant money, and whether it be aircraft utilization, downtime for maintenance or technician training time, all aspects of flight operations were getting a closer look. As a result, pushback began from management on the length of training courses and they began looking for training course efficiencies while still meeting the regulatory requirements. Computer Based Training, CBT, started to make an appearance in aircraft maintenance courses in a supporting role. Although self-paced, it was scheduled into the type courses on aircraft such as the B747-400 and the Airbus A320. CBT would reinforce the instructor’s lectures by reviewing and repeating what students had just experienced. Following these courses, the exams would be rigorous. However, they were more focused to ensure the course objectives were covered. In 2018, aircraft maintenance courses look very different, especially when compared to the early years. From an aircraft technology perspective, we are making generational leaps every few years. From airframe design and the material used in building the latest airframes (such as the B787), to system designs incorporating a distributive functionality. Gone are days of a federated system design where you physically touch a unit. We are getting closer and closer to an era where apps are running our aircraft. For example, an FMS computer, or air data computer, will not be found on an Embraer 170-195 aircraft. However, without a physical unit, how can we train for this new reality and prepare for the future? Uses professional and competent instructors that support and focus on student outcomes. Overall, Pelesys courses are focused on the outcome of the students taking it and what’s best for their learning. We are constantly looking to enhance the student experience and success by providing increased knowledge retention and on the job performance. As you can see, the aircraft maintenance training industry has changed drastically. From no on-the-job manuals and lecture-based courses to independent learning and virtual trainers. Where will it go over the next 50 years? We can’t wait to find out! We would love to hear what you think. Please leave us a comment or connect with us on our social channels. Would you like more information on our services, courseware or maintenance training courses? Send us an email here.